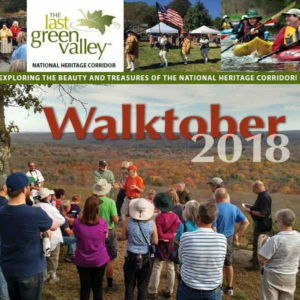 New Walktober Adventures Added to the Schedule! # 204 – Planning for Agritourism on Connecticut Farms: 6:30 – 8:30 p.m., Woodstock Town Hall Rm 1 415 Rt. 169 Woodstock, CT. Is your farm interested in hosting events? Are you interested in learning what other towns have done to support agritourism? Are you a municipal planner or leader interested in developing agritourism zoning regulations? The program will cover the basics of land use planning, model agritourism regulations and farmer experience. There will be an opportunity for open discussion. Sponsored by the Woodstock Agriculture Commission, UCONN College of Agriculture, Health & Natural Resources. # 205 – Chamberlin Mill: 2 p.m., Rain Date Oct. 14. and a free Walktober event at the Mill on October 7 at 2 PM (rain date October 14) (www.chamberlinmill.org). flat 1.5 mile walk mostly on unpaved road surrounded by preserved woodland. Dogs welcome. Walktober participants will be introduced to the Mill and its surroundings, walking along unpaved roads bordered by preserved land. Return participants will get a chance to see the Mill’s restoration progress. Sponsored by Chamberlin Mill. #209 – The Great Four Engine Wreck in East Thompson of 1891: Oct. 10, 7 pm: The Arts Center, 111 Main Street, Southbridge, MA. Tom Chase, formerly of the Smithsonian Freer Gallery and Archivist of the Ramsdell Transportation Collection (THS), and Joseph Iamartino, President of the Thompson Historical Society and editor of the Echoes of Old Thompson history books, will give a rail presentation featuring the story of the Dec. 4, 1891 Four Engine Wreck in E. Thompson. Every known photo of the wreck site will be shown with explanations of the cause of the accident that led to 3 deaths, as well as images of the trains involved, before and after the collisions. Sponsored by the Southbridge Historical Society. #210 – The Great Four Engine Wreck in East Thompson of 1891: Oct. 13, 9 am, Tourtellotte Memorial High School, Ryscavage Auditorium, 785 Riverside Dr. (Rt.12), No. Grosvenordale, CT. Tom Chase, formerly of the Smithsonian Freer Gallery and Archivist of the Ramsdell Transportation Collection (THS), and Joseph Iamartino, President of the Thompson Historical Society and editor of the Echoes of Old Thompson history books, will give a rail presentation featuring the story of the Dec. 4, 1891 Four Engine Wreck in E. Thompson. Every known photo of the wreck site will be shown with explanations of the cause of the accident that led to 3 deaths, as well as images of the trains involved, before and after the collisions. Sponsored by the Thompson Historical Society.